Discussion in 'Apps, Book and Media Reviews' started by Sam Miller III, Nov 22, 2009. Setting Forth the Proper manner of Making the Goggles, Spears and Other Needful Gadgets Together with Descriptions of Many Marvels Witnessed Upon the Bottom of the Sea And Fully Exposing the Author's Cunning Methods of Swimming, Diving & Spearing Fish and Octopi." The very first modern printed document chronicling the genesis of "goggle fishing" or as know today "spear fishing." Saturday Evening Post during the years 1934, 1935, 1937 & 1938. There are very few of the original books on the open market, and there apparently is no clear estimate of the number remaining. Few modern divers, including my self, would not have had the opportunity to own or read the Compleat Goggler if it had not been for the insight and courage of the founder of Skin Diver Magazine. Mr. Charles "Chuck" Blakeslee. He entered into a relationship with the original publisher, Dodd Mead and company who were still in business in 1956 to use the original plates to reprint 1200 copies of the book under the SDM banner in 1957 with an added forward by Mr. James Dugan, a very popular writer of that era and the US public relations agent for Cousteau; who at that time was almost unknown in the US or by the world. The Skin Diver magazine reprint was listed a $5.00 dollars a copy but only a few books were sold, so the remaining books were converted into a marketing inducement. Purchase a subscription to Skin Diver Magazine a receive a copy of the book. Even then very few were sold. In late 1960s the original owners , Chuck Blakeslee and Jim Auxier sold Skin Diver Magazine to the giant speciality magazine company Petersen Publishing in Hollywood. All the remaining editions of the SDM Compleat Goggler which were stored in boxes in the hall way of the firm's Lynwood office were "disposed with extreme prejudice " in the Long Beach California dump by the new owners of Skin Diver Magazine. Chuck Blakeslee is alive and well and lives in a small northern California community with his wife Jere. The current market value of a SDM reprint of the Compleat Goggler is in excess of $300.00. The great pioneer spear fisherman/author/ world explorer Dr Professor Hans Hass who was a young man on a vacation in France when he was introduced to goggle fishing by Mr. Gilpatric. He is the only person remaining alive who knew Mr. Gilpatric and was mentioned in the book. A most excellent review Sam; I'll keep my eyes open. More Years Under the Earth By Norbert Casteret 1962. A description of the exploration of the Cigale're cave system in the Pyrenees. Man Under Water by Henry Billings 1954. A description of mans excursions UW since ancient times. Another HC of JYC's The Silent World 1954 the Reprint Society of London. If no one reinvented the wheel we'd still be driving around on stone wheels. Your collection is rapidly growing into a library! And good for you! You are evidently in an untapped area to have located as many books in one forage. Where I live and throughout California dive books have all but disappeared from the shelves. Keep up that foraging! There is one great Canadian book you might want to search for..Frogmen of Burma about WW11 Frogmen--One of my old diving buddies Frank Rodecker (Aka Frankie the frogman) was a component of the Canadian training and featured in the book. It took me many years to locate it in the US and I paid dearly for it, now rather common and certainly much more reasonably priced than what I was forced to Pay. 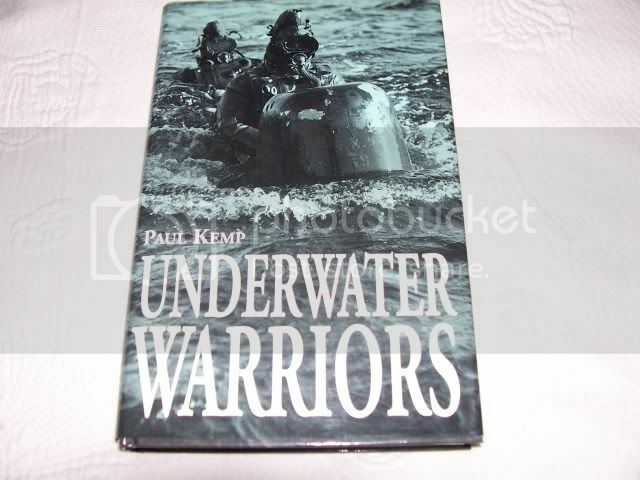 Not "Frogmen of Burma" but close; it's "Underwater Warriors" by Paul Kemp detailing military one and two man submarines and their crews. 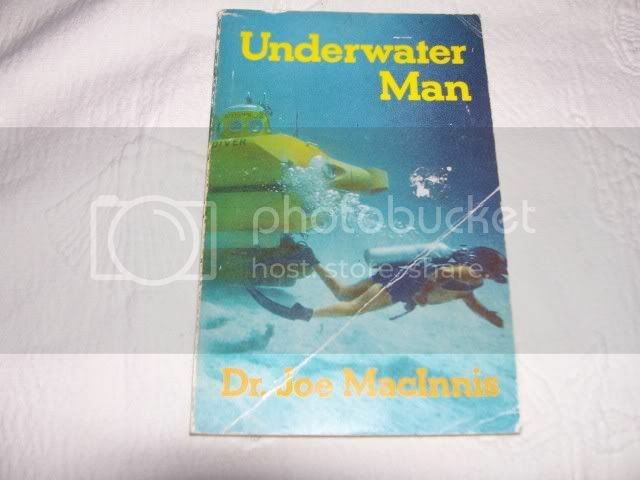 and "Underwater Man" by the good doctor Joe MacInnis himself. 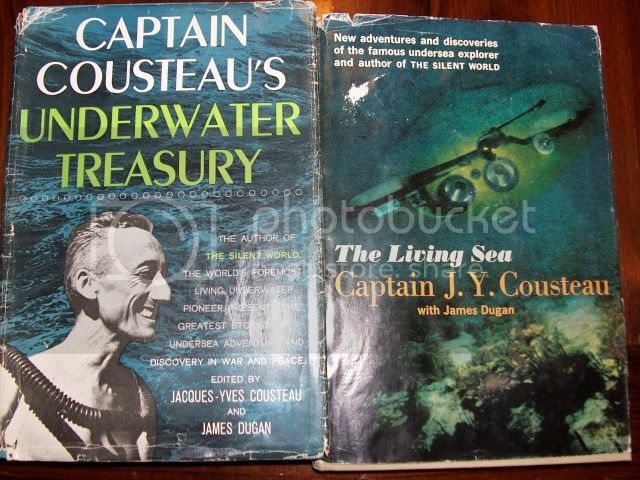 Just picked up these two HC books and in the left one (Underwater Treasury) there is a truncated version of "The Complete Goggler". This may be an easier way to read some of Gilpatrics book rather than trying to find the original (though that would be nice too). I also picked up a PB copy of "Frogmen First Battles" by Schofield and Carisella which chronicles the advent of the Italian Tenth Light Flotilla, the first pioneer divers of WWII.